I recall my problems beginning at about the age of 10, the main reason being my elder sister’s highly unstable diabetes and the enormous stress this inflicted on our family. Two years previously, my father had had a severe stroke and almost died. Although he regained some of his health, he stayed in the same stressful job and clearly could not cope with it. My grandmother lived with us, and there were always many arguments, usually caused by her criticism of my father.I grew up in Russia during its transition from a communist to a capitalist society, which was at times highly confusing. My mother, a kind but very domineering person, was my role model all that time. She spoke negatively of just about everyone she knew, and I absorbed her attitude of not trusting anyone and trying to dislike other people. I grew up lonely, unable to build or sustain close friendships. My lack of social contact led me to observe and analyse life but not really to participate in it. I did not feel very unhappy, though: I had a lot of energy, which I expended on studying and reading, but I never quite managed to get enough attention or love from my parents, as they concentrated all of their energies on trying to manage my sister’s illness. My most serious psychological problems began after my sister had a very bad fit and nearly died (she is prone to epilepsy-like fits, which even now are highly unpredictable and still a puzzle to her doctors). I was 12 and was both shocked and scared by the event. My sister was in a coma for a week, and all this time her screams of pain were being replayed in my head. She had her attack at night, and, years after she got better, I would still wake up at any sound that vaguely resembled her screams and would be violently sick. I also became very afraid of having a good time, as the day and evening before my sister became so ill had been really enjoyable. If I began to enjoy myself, I became terrified. I even started a special diary in which I would try to convince myself that “today was not a good day, so I shall not have to pay for it by suffering tomorrow”. My father’s highly influential position in the publishing industry in Russia meant that he soon came under pressure from the deeply corrupt local government to publish only their political material, to the exclusion of anything from other parties. My father refused and was terrorised by telephone threats and other forms of intimidation for almost two years. Soon the threats reached the family home and there would usually be one or two phone calls from a male telling us, “Prepare to die”, or “Your time is up”. Although I was of a healthy weight, I was teased for having fat legs, and so I started to get obsessed with healthy eating and exercise. It was only a matter of time before I became anorexic. (I was 16 years old.) The teasing continued, but with less intensity – I was teased mainly for the way I spoke and the way I walked. But I worked very hard and excelled at my studies. I was rewarded by an art scholarship for the second year at school and received an unconditional offer from university. It was at this time, however, that I stopped enjoying my life and worked hard only because of a sense of duty. I became obsessional and a perfectionist. Coming second would not do: I had to be first at every subject or I would be a failure. I came first in my year in every subject I took at A level. I started losing my energy – everything felt more and more difficult to do. My family tended to think that anorexia was my way of being nasty to them, and that I could eat well at any time I wanted. This was when I started feeling suicidal, and it cost me a lot of effort not to try killing myself by one means or another. I mentioned this to my family once, when I was particularly upset, but that caused even more criticism. I was told that I had no right to feel suicidal because my life was very good. All this time, my sister was becoming progressively more unwell: first going blind, then suffering kidney failure and having to go for dialysis three times a week. The dialysis never went smoothly, and there continue to be complications, which keep my parents and me under constant stress. I met my future husband, David, four years ago when we bumped into each other in a pub where I was celebrating the end of university exams with a group of students. I was 22, and I had just recovered from anorexia. I have never liked and trusted anyone as much as I did David, and we married two years ago. He has a pure, sincere and caring personality, and, the longer we live together, the happier and more in love with him I become. However, he became quite unwell himself as a result of all the worry over me. For, after another bad episode with my sister’s health last year, my mental health deteriorated dramatically. This was preceded by months of ‘conventional’ counselling therapy, which I had sought in the hope that it would help me deal with my worsening emotional problems. I also started taking a tricyclic antidepressant at around the same time. As the counselling progressed, I felt worse (yet I felt ‘addicted’ to seeing the counsellor) and, for the first time, felt that I was going mad. All of my obsessions, fears and compulsive behaviours worsened many-fold. At the time I was too confused and suicidal to relate this to the counselling or the medication I received. I was put onto a different antidepressant, an SSRI [selective serotonin re-uptake inhibitor], and, a while later, the obsessions weakened, but the rest of the problems stayed the same. I am sure my counsellor meant well when she asked me to bring up the past and talk about my problems, but, instead of getting better, I was getting worse. Last summer, I was no longer able to resist the temptation to end it all and made a number of attempts at suicide. At the time I had no physical or psychological energy left and could not concentrate. I was actually glad when my poor husband took me to the psychiatric ward; I was hoping things would change and that I would get help. I spent three weeks on the ward, but with almost no change at all. The one good thing about it was that staff members were very friendly and supportive, and there were occupational therapy activities, which reactivated my creativity. When I was discharged, I again felt very bad and suicidal, and all of this put an enormous strain on my caring husband. I felt hopeless, seemingly having tried everything and not having got any better. A lot of emphasis was put on a change of medication, and I found myself being treated with yet another antidepressant, but with little difference, if any at all. My GP, the community psychiatric nurse and the psychiatrist all tried hard to help, but seeing them only made me feel better for a couple of hours. I started doing some research on depression and read a number of books, which, although interesting, did not really offer any way forward. Meanwhile, the most helpful activity for me was creative art – I made and painted lots of little clay pots. Then, purely by chance, in a yoga journal, I came across a very interesting article about the human givens approach to treating depression. I was surprised that this terrible illness, which I thought would be with me for the rest of my life, was referred to as simply an ’emotion’. 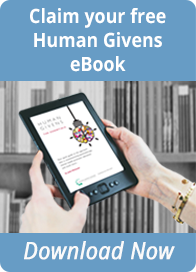 I was sceptical at first, but decided to check the human givens website. As I read through the articles published there, I became more and more hopeful and ordered the monograph, Breaking the Cycle of Depression (note: this monograph has been updated and is now published as How to lift depression – fast). I found it an amazing book that explained what was happening to me and, most importantly, offered simple, wise solutions. As I was reading it, I started feeling increasingly better. I thought I could get right back to normal if I saw a human givens therapist, so I arranged an appointment with a therapist whose details I got from the website. Mike used to ask me how I felt, on a scale of 1 to 10, and the day after the final session I felt 10 out of 10. I was happy and relaxed – just like my normal self. I have since been offered a highly competitive job as a linguist/market analyst with Reuters news agency, responsible for monitoring the equity market of the whole of Russia, with an accuracy level of 99 per cent expected from me. I understand I was picked because of my enthusiasm, positivity and great people skills. I now feel at ease with people, something I have not experienced for many years. Having recently started my job (and in spite of its being a very intensive learning experience so far), I have coped well and feel very positive about it. Most important for me is how I feel about myself; it’s as if the human givens therapy has taken off the layers of unhappiness and uncovered the essence of who I really am, allowing me to feel at ease and confident – the way I felt when I was a child. However, although the Reuters job carries great responsibility, I think I am capable of more. I passed a number of difficult psychometric tests for a civil service fast-track placement (which is my long-term aim) and was notified that I would be invited to attend an interview. During the last session with Mike, I was helped to understand a feature of my personality that answered so many questions for me. I was helped to realise that my mind was naturally very active and constantly required challenges. It suddenly made sense to me why I would always get bored reading novels and watching romantic films on TV. The only non-work-related books that interested me were murder mysteries, and the only TV programmes I could watch were criminal investigations. Indeed, unless my mind was engrossed in solving something, I would start focusing negatively on myself again and become upset. Mike advised me to consider getting a waitress job in a local restaurant whilst I was waiting for my Reuters job to start, and to consider keeping it up part time for as long as I found it helpful. I had my reservations, but followed Mike’s advice and felt better immediately. The waitress job provided me with a lot of social interaction, something that I now realise had been missing. Also, keeping my mind busy in other ways that we had discussed made me feel hopeful and energetic. I started my Reuters job full of confidence and the more information I had to learn, the better I felt. I’ve gradually taken myself off the antidepressant I was prescribed. Not having to rely on the ‘happy pills’ (which truly they are not) is a wonderful feeling of its own, but feeling how strong I actually am is even more rewarding. My sleeping pattern is now back to normal. Coming off the antidepressants has helped to reinforce all of my normal energy, enthusiasm, optimism, pride and assertiveness. My feelings now are not ‘foggy’ or ‘inhibited’ as they were when I was on the tablets. I think people don’t realise that antidepressants not only ‘numb’ the distress and sorrow; they also make it difficult to enjoy life. Yet, less than a year ago, ’empowered’ by the antidepressants and the Freudian counselling model, I was often to be found hunched on the floor, crying and feeling suicidal, just because I was struggling to warm up a takeaway meal, or there was a lot of washing to be done and I did not feel able to do it.